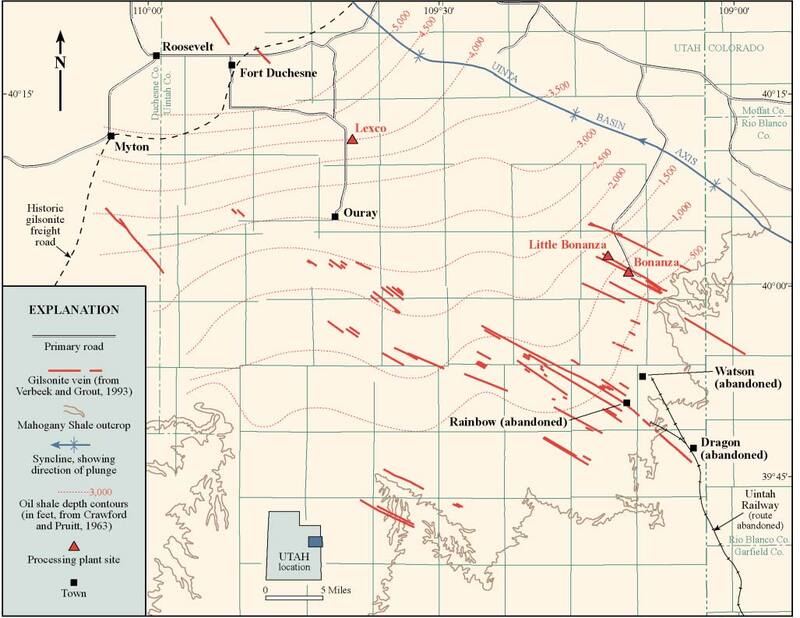 Gilsonite vein locations, industry facilities, and some geologic information for the gilsonite field, Uinta Basin, Utah. Gilsonite is a naturally occurring, solid, black, lightweight organic material that originates from the solidification of petroleum. The dull, black appearance of weathered gilsonite resembles coal, whereas the surface of freshly broken gilsonite is shiny and resembles obsidian. Gilsonite is distinguished by its solubility in organic solvents, low density, and brown streak when rubbed on paper. Solid hydrocarbons like gilsonite are called asphaltites and are found in oil-bearing sedimentary basins, commonly as veins associated with oil shale. There are dozens of asphaltite deposits around the world and many of them have been mined; however, the gilsonite variety is relatively rare and the large size of the Utah deposits makes them unique. Uses Gilsonite has hundreds of industrial applications and is used by companies all over the world. Gilsonite is added to oil- and gas-well drilling mud to stabilize the borehole and decrease friction; it is also used in oilwell cements. Gilsonite and gilsonite-derived resin wet and disperse carbon black pigment in printer’s ink and bind pigment to the newsprint so it does not rub off. Addition of powdered gilsonite to asphalt paving mixes produces a more durable road surface. Paint-like mixtures of gilsonite, solvents, and other additives are used to coat and seal asphalt pavements like driveways and parking lots. Gilsonite is also used as an adhesive and waterproofing agent in the manufacture of roofing felt. Addition of gilsonite makes some paint and wood stain formulations more durable. Gilsonite is added to iron foundry moldingsand mixtures to produce a smoother finish on the cast item and make it easier to unmold. Small amounts of gilsonite are used in fireworks and to manufacture high-purity carbon electrodes. Prices of gilsonite vary from about $250 to $1800 per ton depending on whether it is pulverized, how it is packaged, its melting temperature, or if additives and special processing are involved. Gilsonite is found in dozens of long, vertical, northwest-trending veins in a 60-mile by 30-mile area of the Uinta Basin (see figure). The veins vary in width from fractions of an inch to almost 18 feet, but average about 3 to 6 feet. The continuity of the veins is impressive; they stretch in long, straight ribbons across the hills of the Uinta Basin. These veins are commonly several miles long and the longest vein system in the basin extends 24 miles. The gilsonite veins are also vertically continuous for hundreds to as much as 2,000 feet or more, commonly with only small variations in vein width. The veins are usually rooted in the Green River oil shale, so they are more vertically extensive to the northwest where they are not as deeply eroded. The oilshale depth contours on the accompanying figure indicate potential depth of the veins. Gilsonite veins are found in Tertiaryaged (about 57 to 36 million years old) sedimentary formations in the Uinta Basin. These formations, in order from oldest to youngest, are the Wasatch, Green River, Uinta, and Duchesne River Formations. The veins are best developed in the thick sandstones of the upper Green River and lower Uinta Formations and tend to split and be less continuous in mudstone, marl, and discontinuous channel sandstones. In the Wasatch Formation (below the oil shale), gilsonite is exposed only in veins at the easternmost edge of the gilsonite field where the strata are most deeply eroded. 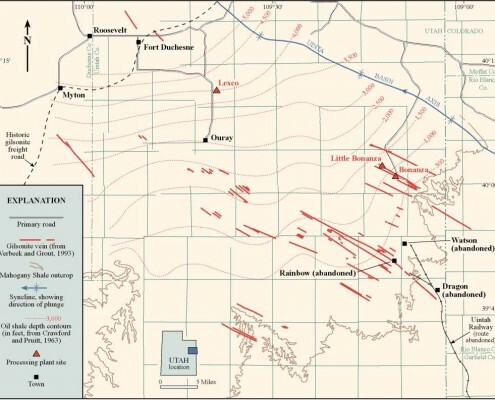 Deformation (thrust faulting and downwarping) associated with the Sevier/Laramide mountain-building episode formed the Uinta Basin. This topographic basin was occupied by lakes of various sizes over millions of years. Large amounts of organic material accumulated on the lake bottom, particularly during one period when Lake Uinta reached its maximum areal extent in the basin. Later, heat and pressure of burial changed the organic-rich sediment into the thick oil shales of the middle to upper Green River Formation. Burial of the oil shale generated water and hydrocarbons that were expelled, fracturing the surrounding rock. The escaping water deposited minerals on the walls of the fractures. Viscous petroleum was later extruded into the fractures, forcing them open, filling associated sills, and in some areas saturating wall rock. The viscous hydrocarbons later solidified into gilsonite. The first documented mining of gilsonite was in 1868, when a blacksmith asked local Native Americans to find coal for his forge. The gilsonite that they (mistakenly) brought him reportedly melted, caught fire, flowed out of the forge, and almost burned down the blacksmith shop. This unusual material also caught the attention of many of the new immigrants in the area who staked claims on the veins even before it was clear what the material was, or how it might be used. Two early prospectors, Bert Seaboldt and Samuel Gilson, experimented with the gilsonite, developed uses for it, and secured financing for development. Gilson’s enthusiasm and promotional ability resulted in the newly discovered material being named after him (its formal mineralogical name is uintaite). The first regular shipments of gilsonite began in 1888, from veins in the western part of the gilsonite field. The gilsonite was shipped 60 miles south by wagon from Myton to the railroad at Wellington. Early development was an intense period marked by exploration, mining property consolidation, negotiation and conflict with Native Americans and government agents, and lobbying in the U.S. Congress for changes to Native American Reservation boundaries. By 1903, the Gilson Asphaltum Company (predecessor of the American Gilsonite Company) controlled most of the gilsonite resource, including large veins that had been discovered in the eastern part of the basin. 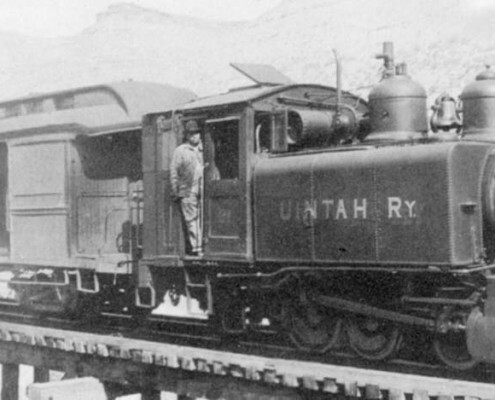 In 1904, Gilson Asphaltum constructed the now defunct, narrow-gage Uintah Railway from the eastern part of the field (near Rainbow, Utah) to the Denver and Rio Grand Western railroad in Colorado. The improved transportation helped the industry expand and develop new markets. In 1935, Gilson Asphaltum moved its operation north from the Rainbow area to a new mine and processing plant at Bonanza and switched to truck transportation. The Gilson Asphaltum Company reorganized, and in 1948 became the American Gilsonite Company that was jointly owned by the Barber Oil Company and Standard Oil of California (now ChevronTexaco Corporation). The company’s research led to the use of gilsonite as a refinery feedstock to produce gasoline, high-purity electrode carbon, and other products. By 1957, American Gilsonite had constructed a refinery in Gilsonite, Colorado, that was connected to their Bonanza plant by a 72-mile-long slurry pipeline laid along the abandoned Uintah Railway route. Gilsonite production rose to about 470,000 tons in 1961 as a result of the pipeline and refinery. The gasoline was marketed under the trade name Gilsoline. Cars fueled with Gilsoline were reportedly easy to identify because their exhaust had a characteristic odor. The company sold the refinery in 1973 and redirected their marketing efforts to nonfuel uses of gilsonite. In 1981, Chevron purchased Barber Oil’s share of American, and in 1991, Chevron sold their interest. Today, the American Gilsonite Company remains the world’s largest gilsonite producer. Small independent companies have long competed with the American Gilsonite Company and its predecessors. Between 1952 and 1962, G.S. Ziegler and Company, originally a gilsonite customer, purchased and operated the properties of many of the small independents and changed its name to the Ziegler Chemical & Mineral Corporation. They have long maintained a plant and office at Little Bonanza and have been a substantial gilsonite producer for more than 40 years. Lexco, Inc. began operations in 1988 and constructed a plant and office southeast of Fort Duchesne. They have mined and shipped ore from veins in the south-central part of the gilsonite field. The original in-place gilsonite resource was estimated at 45 million tons. Most of that ore has been extracted; since 1907 gilsonite production has typically varied between 20,000 and 60,000 tons per year with a spike to 470,000 tons per year in 1961 when American Gilsonite Company’s refinery was operating. Additionally, some of the remaining in-place resource cannot be mined due to geologic and engineering problems. In 1980, an American Gilsonite employee estimated that about 5 million tons of mineable reserves remained in the basin. However, the potential for discovery of new veins, as well as increased resource estimates for small, known veins, may increase gilsonite resource values in the basin. Due to gilsonite’s unusual mode of occurrence in narrow, deep, vertical veins; and the explosion hazard associated with gilsonite dust, gilsonite mining is labor intensive. Mining initially consisted of surface trenching, but all recent work has been underground mining through large-diameter shafts drilled along the veins. Miners use air-powered chipping hammers to carefully break the gilsonite while avoiding contaminating the ore with broken wall rock. Product purity is important to customers. The broken ore rolls down the steep slope to the bottom of the underground mined area where it enters a vacuum tube and is pneumatically conveyed to the surface. Explosives are occasionally used. Gilsonite companies have used other mining equipment in the past including, bulldozers, a small tunnel-boring machine, and water-jet cutters mounted on mine cars and surface drill rig bits. The American Gilsonite Company is currently testing a compressedair- powered, continuous mining machine with a rotary mechanical cutting head. Gilsonite is remarkable for its unusual geologic origin, mode of occurrence, and chemical and physical properties. Also notable are the ingenuity and persistence of the gilsonite company personnel who created a new industry and over the past 100 years have solved mining, processing, transportation, marketing, and other problems to continue to supply this unique Utah material to the world markets. Cashion, W.B., 1967, Geology and fuel resources of the Green River Formation, southeastern Uintah Basin, Utah and Colorado: U.S. Geological Survey Professional Paper 548, 48 p.
Crawford, A.L., and Pruitt, R.G., Jr., 1963, Gilsonite and other bituminous resources of central Uintah County, Utah, in Crawford, A.L., editor, Oil and gas possibilities of Utah, re-evaluated: Utah Geological and Mineralogical Survey Bulletin 54, p. 215-221. Pruitt, R.G., Jr., 1961, Mineral resources of Uintah County: Utah Geological and Mineralogical Survey Bulletin 71, 101 p. Remington, N.C., 1959, A history of the gilsonite industry: Salt Lake City, University of Utah, M.S. thesis, 338 p.
Verbeek, E.R., and Grout, M.A., 1993, Geometry and structural evolution of gilsonite dikes in the eastern Uinta Basin, Utah: U.S. Geological Survey Bulletin 1787, 42 p.
Samuel Henry Gilson’s flamboyant, enthusiastic personality overshadowed all other early gilsonite developers, most of whom are only briefly mentioned in obscure historical references. Sam Gilson had a wide range of interests and occupations. At various times he: raised horses for the Pony Express, was a cattle rancher, was a metals prospector and miner, invented a successful ore concentrating machine and an unsuccessful flying machine, experimented with an oven to convert coal to coke, and was the U.S. Marshall who supervised the execution of John D. Lee at Mountain Meadows. Gilson also obtained gilsonite samples in 1885 and began to experiment with uses (including chewing gum). Bert Seaboldt, Manager for Construction for the Denver and Rio Grande Western Railroad, shared Gilson’s interest in gilsonite – the two became partners, procured financing, and developed gilsonite mines and markets. They had many other partners in the early days; one set named their company the Gilson Asphaltum Company and adopted “gilsonite” as their trademark, ensuring Sam Gilson’s place in mining history. Other industry founders to be remembered (besides Bert Seaboldt) are T.J. Almy, R.C. Chambers, Richard McIntosh, George Goss, Walter Almy, Abraham Hanover, and C.O. Baxter.